Picture - Lt. Foulois and Orville Wright in 1909. Benjamin Delahauf Foulois (December 9, 1879 - April 25, 1967), was a United States Army general who learned to fly the first military planes purchased from the Wright Brothers. He became the first military aviator as an airship pilot, and achieved numerous other military aviation "firsts". He led strategic development of the Air Force in the United States. Benjamin "Benny" Delahauf Foulois was born on December 9, 1879, in Washington, Connecticut, to the son of a French veteran of the Franco-Prussian War (1870-1871), and a Boston-born nurse. At age 18 he used his older brother’s birth certificate to enlist in the Army to support the Spanish-American War, but arrived in Puerto Rico just weeks before the armistice was signed. As an engineer, he fought off the rampant tropical diseases, and after five months, was shipped home and mustered out. On June 17, 1899, Foulois enlisted again, as a private in the Regular Army and was assigned to the 19th Infantry, where he achieved the grade of first sergeant. After service in the Philippines at Luzon, Panay and Cebu, he was commissioned as a 2nd Lieutenant on July 9, 1901. Foulois was transferred to the 17th Infantry, and served in Manila, Cottabato and Mindanao. During two separate assignments in the Spring of 1902 and from 1903-1905, he participated in engagements against the Lake Lanao Moros, successfully hunting down and defeating combatant tribal leaders. "In all future warfare, we can expect to see engagements in the air between hostile aerial fleets. The struggle for supremacy in the air will undoubtedly take place while the opposing armies are maneuvering for position..."
He forecast the replacement of the horse by the airplane in reconnaissance, and wireless air-to-ground communications that included the transmission of photographs. As a result, the staff of the chief signal officer selected Foulois for the aeronautical board designated to conduct the 1908 airship and airplane acceptance trials. After having selected the Thomas Scott Baldwin airship as the winner of the trial, Foulois was selected as the first military crewman. He took his first flight on August 18 as engineer-pilot while Baldwin controlled the rudder at the aft end. Picture - Lieutenant Benjamin Foulois. Texas. 1911. Foulois' first aviation assignment was to the Aeronautical Division, U.S. Signal Corps, where he operated the first dirigible balloon of the U.S. Government. The crash of the Wright Flyer, procured at the same time by the Army on its final test flight, September 17, 1908, claimed the first US military airplane fatality, 1st Lt. Thomas E. Selfridge, and also injured Orville Wright. After one year, Foulois had concluded through his experience, understanding of military dirigibles in Europe, and talks with Tom Baldwin, that there was no military future for lighter-than-air aircraft. In expressing this opinion to the Army General staff, Foulois recommended no more purchases of dirigibles, the first of many disagreements with the military establishment. The Wright brothers spent ten months following the fatal crash making engineering improvements to the airplane. By July 1909, Orville was ready to complete the acceptance test for the Signal Corps. On July 30, 1909, Foulois’ first flight in an Aeroplane was the evaluation test flight from Fort Myer to Alexandria, Virginia. Pilot Orville Wright and observer Foulois broke previous speed, altitude and cross-country duration records, flying at 42.5 mph, 400 feet, and for 10 miles. The Army purchased this Wright Model A, Serial No. 1, their Military Flyer, which became Signal Corps Aeroplane No. 1. The final condition of the contract was to train two pilots. Foulois hoped to take direct instruction from the Wright brothers, but instead was sent to France in September 1909 as a delegate to the International Congress of Aeronautics. While he was away, Lieutenant Frederick E. Humphreys made the first military solo in an airplane, on October 26, 1909. Lieutenant Frank P. Lahm followed, but on November 5, both pilots were involved in the crash of the Army's only airplane. Both pilots were reassigned to their non-flying units, and the aircraft was shipped to San Antonio, Texas. On his return Foulois obtained less than one hour of instruction from Wilbur Wright, but did not solo. After the November 5 crash, and a stand-down while parts were ordered, it was decided to seek a warmer training climate. Foulois was directed to report to Fort Sam Houston in San Antonio, Texas and from there he was directed by the Army chief signal officer, Brig. Gen. James Allen, to “teach yourself to fly.” He did so, and at 9:30am on March 2, 1910, on the Arthur MacArthur parade field made four flights on a Type A Wright Flyer, which include his first solo takeoff, first solo landing, and first crash. In the next two years, Foulois made modifications and demonstrated the use of the Wright B aircraft for aerial mapping, photography, reconnaissance and the use of the radio while airborne. He substituted wheels in place of skids, and installed the first seat belt. On March 3, 1911, Foulois and Philip O. Parmalee made the first official military reconnaissance flight, looking for Army troops between Laredo and Eagle Pass, Texas, with a ground exercise in progress. In December 1913, Foulois was offered an assignment to act as trouble shooter for the problem-plagued Army aviation school in San Diego, California. Foulois was able to reduce the early fatality rate for pilots from 25% to nearly zero. On November 19, 1915, Foulois led the first squadron cross-country flight of six Curtiss JN3’s from Post Field, Fort Sill, Oklahoma, to Ft Sam Houston, San Antonio, Texas, which became the new home of the 1st Aero Squadron. In 1916 Pancho Villa crossed into New Mexico and killed 17 Americans. In response, Brig. Gen. John J. Pershing was directed to pursue Villa into Mexico, and Foulois was ordered to take eight airplanes to provide reconnaissance and communication. On 15 March 1916, Capt Foulois, and his 1st Aero Squadron, arrived at Columbus, New Mexico for duty. On the 16th, Foulois flew as the observer with Capt Townsend F. Dodd on the first American military reconnaissance flight over foreign territory (overflying Mexico in search of Villa). Within eight weeks, six of the aircraft had been destroyed as the airplane could not contend with the high altitude, severe weather and dry atmosphere. In April 1917, America entered World War I, and Foulois was rapidly promoted to temporary Brigadier General. At the Office of the Chief Signal Officer, in Washington, he finished the plans to build an air force to support the three million-man army. Foulois took the $640 million plan and draft legislation to the House Military Affairs Committee and won approval over the Army General Staff’s own recommendations. Foulois would find his way to Congress many times over the next 17 years in attempts to overcome the resistance of the Army and Navy senior leadership to any change in the status quo. The fledgling Air Service of the American Expeditionary Force (AEF) was in turmoil when Foulois was assigned as Air Service Chief in November 1917. Resentment of Foulois’s staff, with inexperienced and recently commissioned non-flying officers, led to strong criticism from Brig. Gen. William “Billy” Mitchell, who commanded the Air Service Zone of Advance. In May 1918, Pershing appointed Brig. Gen. Mason M. Patrick to replace Foulois, who then became Patrick’s assistant. Mitchell and Foulois would clash bitterly over the years. Both were ambitious, strong-willed, independent thinkers, but Mitchell came from a wealthy family and was the son of a United States Senator. Foulois came from a working-class family, and impressed his peers with his willingness to roll up his sleeves and work with the mechanics. Both would play an important role in the development of the independent Air Force, but Mitchell worked by swaying public opinion, while Foulois preferred to make direct testimony to Congress, with often controversial verbal attacks against the military establishment. In March 1917 Foulois worked with Colonel George Squier, the Aviation Section Chief and the National Advisory Committee for Aeronautics to detail plans for appropriations of $54 million to support 16 aero squadrons, 16 balloon companies, and nine aviation schools. The French government requested the U.S. provide 4,500 trained pilots by the Spring of 1918, which would require 4,900 training aircraft and 12,000 combat planes. The appropriation signed on July 24, 1917, was for $640 Million, the largest for a single purpose in the history of Congress. On the same date, Foulois was promoted from major to the temporary rank of Brigadier General, to enable him to oversee this responsibility. From March to September 1917, General Foulois was charged with the responsibility for the production, maintenance, organization and operations of all American aeronautical material and personnel in the United States. In October 1917, he was transferred to France, and had the same responsibilities in France, the British Isles and Italy. "Just when things had begun to work smoothly, a shipment of aviation officers arrived under Brigadier General Benjamin Foulois, over one hundred in number, almost none of whom had ever seen an airplane….As rapidly as possible, the competent men, who had learned their duties in the face of the enemy, were displaced and their positions taken by these carpetbaggers." "...this extract is proof of Mitchell’s disregard for facts” and “While Mitchell had every right to have an opinion about me and my staff, his attitude toward us made our jobs doubly difficult. The seeds of insubordination had already been sown when I relieved him, and his memoirs prove how distorted an opinion he had of himself as an expert on air matters." In May 1918, Foulois recommended to General Pershing that Mitchell should be replaced. Foulois was appointed chief of air service, First Army, with Mitchell as chief of 1st Corps. The ensuing change of command and Mitchell’s unceasing bitterness against Foulois continued. Foulois wrestled with self-doubt. He recognized that while Mitchell was openly insubordinate, disloyal to his superiors, and constantly deviating from the military chain of command in giving orders, he did have an ability to supervise air battles and create a high fighting spirit, exemplified with the battle of Chateau-Thierry. 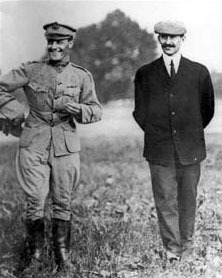 In August 1918, when a major loss of coordination between offensive units and replacement units occurred at Toul, Foulois recommended to Pershing that Mitchell resume his previous command as chief of air service. Foulois was designated assistant chief of the air service, zone of the advance. After the Armistice, November 11, 1918, Foulois served with the chief of the air service on the Supreme War Council, drafting the air clauses of the Treaty of Versailles. Upon his return to the U.S. in July 1919, Foulois was assigned to the Office of the Director of Air Service at Washington, D.C., in charge of the Air Service Liquidation Division, responsible for the settlement of war claims against the United States. Just as quickly as he had been promoted from Major to Brigadier General, he was reduced in rank to permanent Captain in the Infantry and temporary rank of Major in the Air Service. In August 1919, Foulois appeared before the Frear subcommittee hearings on aviation, and before the Senate Military Affairs Subcommittee considering the Crowell Commission report (which advocated an independent air force) in October. He testified with stinging accusations toward the Army General Staff and Franklin D. Roosevelt, the assistant Secretary of the Navy. Having stirred up Washington, Foulois heard that a military attach� was needed in Germany with aviation expertise. Since the United States had not yet ratified the Treaty of Versailles, the allies would not share any intelligence with Foulois, and technically the U.S. was still at war with Germany. Foulois found that the Adlon Hotel bar in Berlin was frequented by many aviation cognoscenti. By sharing food and Allied whisky, Foulois was able to obtain a large amount of aviation intelligence from German pilots who included Hermann Gx�ring. After gaining the confidence of these sources, Foulois was invited to join the two top aviation organizations in Germany: the German Aeronautical Scientific Society and the Aero Club of Germany. Foulois gathered the equivalent of a railroad boxcar full of valuable documents, drawings, technical bulletins, magazines, books, blueprints and reports. By having talked with more than 180 individuals, he had a valuable collection of German aviation knowledge. However, he wrote: "I only hoped that it was being put to good use in America. To my eternal regret, it wasn’t. The lack of an air intelligence collection system, inexperience on the part of the military intelligence officers in regard to aeronautics, and a lack of appreciation for the potential value of the fruits of German genius caused much of the material I sent to end up unopened in a warehouse and later sent to the trash heap." 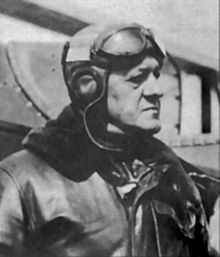 After many years, Foulois achieved his desire to command a flying unit, and was assigned command of Mitchel Field, Long Island, New York, in 1925. The same year, Billy Mitchell was convicted in a court-martial, which resulted in his resignation in February 1926. Picture - Brig. Gen. Benjamin D. Foulois (left), Maj. Gen. James E. Fechet and Brig. Gen. H. Conger Pratt. In December 1927, Foulois was appointed assistant chief of the Air Corps, and in June 1929 chief of the Materiel Division at Wright Field, Dayton, Ohio. He was then reassigned to the Office of the Chief of Air Corps, Washington, D.C., in July 1930. In May 1931 he commanded the Air Corps exercises, leading an armada of 672 airplanes, coast-to-coast defense flights, combat competition and large scale attacks. The leadership of this exercise earned Foulois the Mackey Trophy for the most meritorious flight of 1931. On December 19, 1931, he was designated Chief of the Air Corps, and promoted to major general. Foulois had already appeared before Congress on 75 occasions to testify on military matters. During the next four years, he was in constant communication with Congress on the future of the Air Corps, during a time when economic hardships were forcing severe budget cuts. Coast defense had traditionally been a primary function of the Army, with the line of demarcation the range of its coast artillery guns. The range of aircraft ostensibly confused the issue and opened a competition between the Air Service and Naval Aviation for the mission, and thus for further development of its service. A compromise reached between the Chief of Naval Operations and General Douglas MacArthur in January 1931 gave the land-based Air Service the mission, while the Navy was to defend the fleet. Following that, the apparent invincibility of long range Martin B-10 bombers against the slower Boeing P-12 pursuit planes led Foulois and the Air Corps leadership to begin the development of long-range bombers in 1933. Without this foresight, the development of the B-17’s and B-24’s, essential to eventual separation of the Air Force from the Army, would not have taken place. 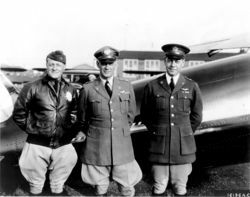 General Foulois was Chief of the Air Corps during the "Air Mail fiasco" of 1934. At the time, commercial air carriers derived stable income from carrying the U.S. mail. Allegations of a conspiracy to defraud the government in these contracts resulted in assignment of all air-mail delivery to the Air Corps, beginning on February 19, 1934, and lasting through May 17, 1934. The 1.5 million miles flown by the Air Corps pilots, with insufficient training, equipment, funding, and experience, resulted in numerous fatal crashes. Foulois became the middleman in a political battle between the commercial aviation owners, Congress, and the military. Foulois viewed the "fiasco" just as historically significant as the first flight or the first air combat mission. He believed its lasting effect helped identify the needs of the peacetime Air Corps and the Baker Board's recommendation for a GHQ Air Force. This was implemented in March 1935. The 1934 Rogers Subcommittee investigation into improper contracting and procurement awards called for the resignation of Foulois. Although he carried his fight to the public through the media, Foulois decided to retire so that the focus could return to the vital task of building the Air Force in the face of a resurgence in German airpower. General Foulois retired from active duty December 31, 1935, after 37 years of service. In spite of his remarkable career, he left with no farewell from the General Staff, no parade, and no aircraft fly-by, all typical rituals of a retirement of a Major General. He accurately warned of the buildup of German air power, and the need to build a strong air force and to take defensive measures to protect the East Coast. Prior to World War II, he ran New Jersey’s civil defense program. In 1941, Foulois ran for the House of Representatives from New Jersey's second district, losing to four-term Democrat incumbent Elmer H. Wene. He turned down an invitation to return to active duty in 1942, but continued to write and speak for 17 years from his home in Ventnor, New Jersey. Following his wife’s death in 1959, Foulois was invited by the Air Force Chief of Staff, General Thomas D. White, to live at Andrews Air Force Base and become the senior spokesman to promote Air Force issues. He traveled approximately 500,000 miles by air, emphasizing national security to the men and women of the U.S. Air Force at home and overseas. In 1963, Foulois appeared on the television quiz show I've Got a Secret, where his secret was that he had once been the entire U.S. Air Force. He recounted his inspiration for the airplane seat belt, saying that he'd had it installed after a crash had almost thrown him from "the damn plane." Foulois' casual use of what was then a television vulgarity provoked a nervous look from host Garry Moore. General Foulois died on April 25, 1967, following a heart attack at age 87, and was buried in his hometown of Washington, Connecticut. Foulois had worked for 18 months with Carroll V. Glines on a biography of his life, though he died before the publicity tour could take place. The book, titled "From the Wright Brothers to the Astronauts", was published in 1968, and Glines received ten copies which he sent to various Air Force and personal friends. According to Glines, publisher McGraw Hill accidentally destroyed all copies of the book and the printing plates, and were unable to provide Xerox copies of the book. The biography was republished in 1980 for sale to libraries; only 400 copies were produced. A new edition of the biography, re-titled "Foulois: One-Man Air Force", is due in March 2010. As one of the longest living of the first military pilots, Foulois saw the steps into space of the Apollo Program - a direct legacy of his many career “first” milestones. He remains one of the most significant figures in the development of U.S. air power. Asked how to say his name, he told The Literary Digest "Rhymes with to cloy: foo-loy'." (Charles Earle Funk, What's the Name, Please?, Funk & Wagnalls, 1936.) The French pronunciation of Foulois family name is "fool-wah". General Foulois is a member of the Military Intelligence Hall of Fame. The Benjamin D. Foulois Creative and Performing Arts Academy in Morningside, Maryland, is named in his honor. "Air Force Link Biography of Major General Benjamin Delahauf Foulois"
"Benjamin Foulois: National Aviation Hall of Fame"
"Baseball stunt with Foulois and Babe Ruth"
Borden, Norman E., Jr. (1968). Air Mail Emergency. 1934: An Account of Seventy-Eight Tense Days in the Winter of 1934 When the Army Flew the United States Mail. Freeport, ME, Bond Wheelwright. Cagle, Eldon, Jr. (1985). Quadrangle: The History of Fort Sam Houston. Austin, TX, Eakin Press. Cornelisse, Diana Good. (1992). The Foulois House: Its Place in the History of the Miami Valley and American Aviation. Dayton, OH, History Office, Aeronautical Systems Division, Wright-Patterson Air Force Base. Foulois, Benjamin D., Glines, C. V. (1968) From the Wright Brothers to the Astronauts: The Memoirs of Benjamin D. Foulois. New York, McGraw-Hill. ISBN 040512211X. Frisbee, John L. (Ed.) (1987). Makers of the United States Air Force. Washington, Office of Air Force History. Jacobs, James W. (1984). National Aviation Hall of Fame (U.S.). Enshrinee Album: The First Twenty-One Years. Dayton, OH, National Aviation Hall of Fame. Shiner, John F. (1975). The Army Air Arm in Transition: General Benjamin D. Foulois and the Air Corps. 1931-1935. Ann Arbor, Ml, University Microfilms. Shiner, John F. (1984). Foulois and the U.S. Army Air Corps, 1931-1935. Washington, D.C.: Office of Air Force History.